It's a fact that emergencies sometimes arise when you least expect them. If you have a friend or relative. that needs some financial assistance, it's good to know the best way to transfer your money. Many money transfer services allow customers to send funds online, and have that payment directed to another back account or a money pickup location across the globe. This easy money transfer provides a tremendous amount of convenience, and saves the hassle of searching for and driving to a money transfer location where you may not feel entirely safe. 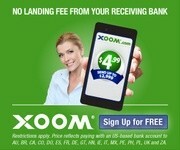 Xoom leads the pack with the latest in money transfer technology and pricing. Their customer policies are customer focused, and the fees are some of the lowest available. When you need to send money fast and far, Xoom is a great place to consider. Ria makes transferring money simple and easy-to-understand. Their price calculator lets users know upfront how much it will cost to send money to more than 147 countries, with very reasonable fees for debit card, credit card, and bank transfers. Western Union has historically been the go-to place for sending money. While you may pay a little more for their service, they've earned their reputation for being a reliable and safe way to send money to anyone, anywhere. Recent years have been challenging for Money Gram's reputation. A combination of dealings in illegal activity and bad charges make them the least desirable money transfer company to do business with. Online money transfers can be made from the convenience of a computer, using a credit card, debt card or bank account information. The money is then sent immediately to whomever you wish, for a fee. The fees for this service vary depending on the recipient country, currency and more. Location. Will the money transfer service work with the bank you want to send to? If not, where can you send your money so that it can be picked up? Cost. What are the fees involved with the money transfer? How fast can your money be moved? How does that compare to the competition? Reputation. Does the money transfer service have a strong reputation in the marketplace? TopConsumerReviews.com has reviewed and ranked the best money transfer services available today. We hope these reviews help you send money safely right away! People who are traveling across the world decades and centuries ago carried their money on their person. On the bright side, times have changed and our world is constantly evolving and growing.